In January 2014 French writer Than-Van Tran-Nhut swapped the boulevards of Paris for the windswept hills of Wellington. Here, she reflects on her six months in Thorndon as writer-in-residence at the Randell Cottage. I’m back in Paris now and living my second summer this year. After a spell of cold and rainy weather, the temperature has risen again and I hope the white Japanese anemones will settle nicely under my rose bushes. In between their roots are bits of New Zealand soil, and some of their leaves once stirred in the Wellington wind. They are my links to a small garden on a hill in Thorndon. It has been weeks since I left, but I still return to Randell Cottage in thought. I only have to close my eyes and recall the familiar routines: pulling up the shades of the entrance door in the morning and leaving it open, lifting the sash window in the kitchen to let the wind fill the rooms, connecting to a wi-fi network named Writers Trust. That’s how it was for almost six months and I can still feel the cool brass of the hexagonal doorknob, the little snib that keeps the lock retracted. The front door stays open most of the time, a luxury one can afford in this part of the world. Bird songs and occasional music drift into the house. There are no locks on the gate, no shutters on the windows, just a welcoming threshold. I remember the light in Wellington. Golden rays on the afternoon of my arrival in January, washing over the Cottage while shadows gathered beneath the hills; pale light reflecting off a blank grey sky; black light on hot pink flowers and tangerine-coloured leaves, when magic took over the Botanic Garden; illuminated words cut into Katherine Mansfield’s metal skirt; the glow of a bus brushing across the Braille sculpture on Lambton Quay. I remember the string of yellow and red lights moving along the coastline as I looked across the Lady Norwood Rose Garden from the spur above; darkness closing in on the harbour under clouds grazed by a dying sun. And the silver sliver of a moon sailing through a sky studded with unfamiliar stars, the Southern Cross to remind me that the Equator lies north and the South Pole is only 5400 km away. There were days of rain, but not enough to dampen my memories. Drizzles and showers, the sound of drops skipping on the path or pounding on the iron roof just meant more moisture for the plants. And weren’t we surrounded by water anyway, with the harbour beckoning below, lustrous or leaden, depending on the mood of the clouds? I would run down to the wharf, racing through the old tombstones in Bolton Street Memorial Park, to watch people jump off planks, their bodies in flight before they hit the icy water. Beneath the surface, clinging to wooden poles, yellowy crabs and star-shaped creatures watched them fall in slow motion, shrouded in a veil of bubbles. Of course there was the wind, chasing clouds over Tinakori Hill, making airport windsocks fly frantically while airborne planes dipped and yawed – the kind of wind that lifts a giant eagle with a wizard astride and messes your hair when your picture is being taken. And you know you’re not in France when a wind from the south means chilly weather. I loved this place where the moon waxes and wanes in the opposite direction to the one in the northern hemisphere, where people drive on the left-hand side, rotate clockwise at roundabouts, and swim laps likewise (yet run laps anticlockwise?). It’s all a matter of symmetry and it forces you to change your point of view. It has been six months of ongoing discovery: trevally and tarakihi, red cod and hoki, kumara and Smitten apples, flat white and magic slice, hangi and fish & chips. On the track of an extinct endemic gecko, I stumbled upon feisty kaka, clever kea, a precious white kiwi, two nearsighted kune kune and one short-lived baby fantail. I had mesmerising encounters with birds and beasts drawn by French explorers in the 19th century. I was able to pore over atlases printed in Paris in 1826 while sitting in the National Library of New Zealand, 19000 km away and 188 year later. All this thanks to a book collector named Alexander Turnbull whose grave I always ran by on my way down to the city centre. I was surrounded by books: Two Worlds, First Meetings between Maori and Europeans, 1642-1772, written by Anne Salmond; The Mijo Tree by Janet Frame; a pile of works by New Caledonian authors. In the Cottage were books that gave me a glimpse of New Zealand society: short stories by Katherine Mansfield and other Kiwi writers, The Honey Suckers by Victoria McHalick, novels by Fiona Kidman and Kirsty Gunn (the Kiwi 2009 Randell Cottage resident), The Collector’s Dream by Pierre Furlan (the French 2004 Randell Cottage resident), so beautifully translated by Randell trustee Jean Anderson. And one very special book written by Susan Price: A Mind of His Own, The Childhood of Hugh Price. It tells the story of the young boy who, with Beverley and Susan, would later gift Randell Cottage to the Trust, making the writers residency possible. It contains old pictures of houses, ships and trains, toys and stamps, notebooks and certificates, things that make up a life and keep its memory alive. Above all, it shows the love of a daughter for her father. Every time I opened the gate, I was reminded that Randell Cottage is a Wellington landmark: the round metal plaque states that it is a Notable Home – Home of Sarah & William Randell, bricklayer, and their ten children. On several occasions, from my desk, I sighted groups of tourists peering into the garden. Behind waves of pink anemones the small house with a red roof elicited looks of appreciation and it felt nice to be somehow a part of a historical place. On my numerous visits to Te Papa, I would stop at the World of WearableArt exhibition, where clothes from past international shows held in Wellington were on display. I marvelled at the creativity of the designers: a gown bristling with spikes of polished wood, a shiny laser-cut dress crafted after a Rorschach inkblot, a bodice etched with an ancient map, under a coat lined with paua shells. And a corset of white china whose blue willow pattern had been directly lifted from a plate donated by Beverley Randell. 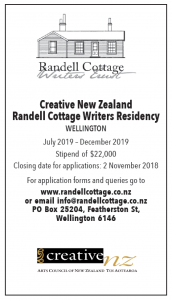 Once again, Randell Cottage appeared in the warp and weft of Wellington’s cultural fabric, as history wove itself into art and beauty. Even when I went to the movies I was reminded of the Cottage. Relaxing in a velvet-clad sofa at the Light House Cinema where I saw What We Do in the Shadows, a parodic vampire movie filmed in Wellington, I followed Taika Waititi, Jonathan Brugh and Jermaine Clement on their nightly prowls. True, they were keen on any unclogged artery, but they definitely demonstrated good taste when they singled out Denis Welch, my predecessor at Randell Cottage. During my residency, I left Wellington several times: I went to the South Island to hike with my husband Joël who came to visit; to Christchurch, Auckland and Palmerston North, on my tour of the Alliances Françaises in New Zealand; to New Caledonia where I was warmly welcomed by Nicolas Kurtovitch (the French 2007 Randell Cottage resident); to Australia to give talks at universities in Melbourne, Canberra and Adelaide. I left many times. But always I left lighthearted because I knew I’d return. I roamed endlessly around the Botanic Garden where blue and purple hydrangeas grew in a fairytale hollow. I watched the seasons pass as roses bloomed and withered, their petals scattered by the wind. I felt the temperature plummet and saw the light fail, when the summer song of the cicada ceased sometime overnight. Time was catching up on me. So I tried to outrun it by doing more, cramming my days with new experiences, stretching them till three in the morning. I hopped on bus 10 to the zoo, bus 11 to Seatoun to do the Eastern Walkway, took the East by West Ferry to Eastbourne. I committed to memory the sound of traffic lights signalling it was safe to cross, the tug needed to open the letter box by the gate, the shimmer of the silver fern globe floating above Civic Square. The last moments I spent with my friends in best-loved places: dining out and drinking ginger beer at Sprig & Fern;having tea at the Cottage; indulging in an afternoon flat white at French Cancan; returning to my favourite haunt, the hole in the wall on Bond Street called Fisherman’s Plate, with superb Vietnamese soups and derelict decoration. In the end, at five in the morning on 26 June, Gollum watched Fiona Kidman and her husband Ian give me my last Kiwi hug. In Sydney I started at the boarding call for a flight to Wellington. Only this time, it wasn’t for me. And yet, half a world away and ten time zones behind, I haven’t lost my bearings. Just as explorers of old, hoping to return, buried bottles in the sand to mark their passage, so I’ve left a part of my heart under long white clouds – right here: 41°16’42.8″S, 174°46’06.3″E.